This is our fourth year enjoying 26 weeks of creative meals from whatever comes in our Goat Lady CSA box. I love unpacking our share and starting to imagine the dishes for the week. 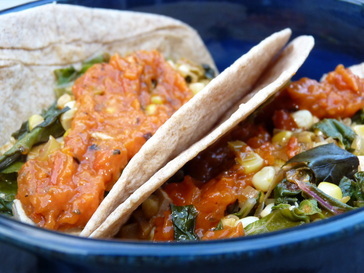 Today’s delivery included swiss chard, leeks, and garlic, and I combined those ingredients with others we had on hand for a smoky vegetarian taco dinner. These tacos would also make a great vehicle for shrimp, pork, or chicken – or any protein that pairs well with the smoky flavor of chipotle peppers in adobo sauce. lime wedgesHeat the olive oil over medium heat in a large skillet. Add the leeks and cook until soft and beginning to brown, about 8 minutes. Add the garlic and cook another 2 minutes. 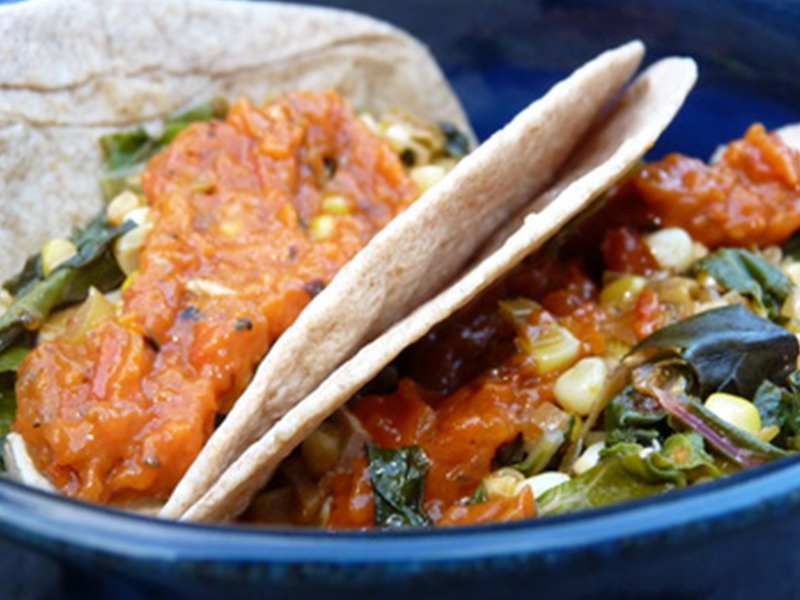 Stir in soy sauce, chipotle peppers and adobo sauce, tofu (or meat), corn kernels, Swiss chard, salt, and pepper. Cover pan and cook about 4 minutes, until Swiss chard wilts. Spoon mixture into warm tortillas of your choice and top with cilantro. Serve with lime wedges.Tonight I topped these with leftover Korean salsa, which had a sweet and smoky flavor from roasted tomatoes and onions paired with Korean red chile paste. If you like smoky flavors, this is a great combination.